I was able to install eCS 2.0 Beta3a on my other new toy the Pundit AH2 barebone system equipped with an AMD Athlon64 X2 3800+ EE (the CPU-Heatsink is cool == room temperature; Chipset head sink is hand warm). LAN doesn't work so far (I'm currently downloading your latest PCI from hobbes right now - would be nice if Mensys/Serenity could include the latest version on the CD). There is one on it the CD but the PCIDEVS.TXT is missing. ACPI seems to work but SMP doesn't seem to work. The above is now "GOOD". -Onboard nForce 410/430 NIC does work now (thanks to nickk for his nveth driver). One week before nickk came with that driver I bought a dual NIC Intel 100Pro card (one card with two NICs onboard - because of limited PCI-Slots). I haven't tried to use Sound as I don't need it (--> Server). The only thing missing now is Cool'n'Quite to reduce the processor clock when there is nothing to do (which is the case 23h+ hours each day). 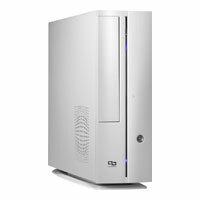 The computer currently uses round about 110 W when running which could be reduced to about 70W with Cool'n'Quite. I've already posted the link to the driver source (used with Linux) to change the clock-speed of the Athlon64 X2 models on the ACPI forum but sadly so far no one seems to have looked into it. Additional note to my previous comment. -SMP and therefore ACPI with /SMP switch is currently only working with ACPI v2.22. The new line of ACPI drivers (3.0.x) has serious problems with this machine. So far these problems couldn't be resolved. /!NOD is important, otherwise it didn't work here. I've switched back from SNAP to Panaroma VESA driver (Feb. 2008 version) just in case you have problems with the graphic driver. As mouse driver I use AMOUSE with the SMP parameter (DEVICE=C:\ECS\SYSTEM\AMOUSE\AMOUSE.SYS SMP). Mouse and Keyboard are attached using USB.